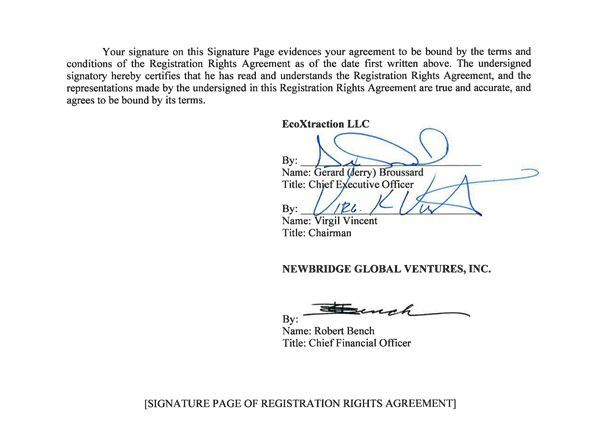 This REGISTRATION RIGHTS AGREEMENT (the “Agreement”), dated as of February 14, 2019 (the “Execution Date”), is entered into by and between NewBridge Global Ventures, Inc., a Delaware corporation with its principal executive office at 2545 Santa Clara Avenue, Alameda California 94501 (the “Company”), and EcoXtraction LLC, a Louisiana limited liability company, with offices at 112 Oil Center Drive, Lafayette, LA 70503 (the “Investor”). WHEREAS, as an inducement to the Investors to execute and deliver the Asset Purchase Agreement, the Company has agreed to provide certain registration rights under the Securities Act of 1933, as amended, and the rules and regulations thereunder, or any similar successor statute (collectively, the “1933 Act”), and applicable state securities laws, with respect to the shares of Common Stock issuable pursuant to the Purchase Agreement. “1933 Act” shall have the meaning set forth in the recitals. “1933 Act” shall have the meaning set forth in in Section 6.01. “Additional Registration Statement” shall have the meaning set forth in Section 2.03. “Agreement” shall have the meaning set forth in the preamble. “Claims” shall have the meaning set forth in in Section 6.01. “Common Stock” shall have the meaning set forth in the recitals. “Company” shall have the meaning set forth in the preamble. “Execution Date” shall have the meaning set forth in the preamble. “Indemnified Damages” shall have the meaning set forth in in Section 6.01. “Indemnified Party” shall have the meaning set forth in in Section 6.02. “Indemnified Person” shall have the meaning set forth in in Section 6.01. “Investor” shall have the meaning set forth in the preamble. “New Registration Statement” shall have the meaning set forth in Section 2.03. “Person” means a corporation, a limited liability company, an association, a partnership, an organization, a business, an individual, a governmental or political subdivision thereof or a governmental agency. “Principal Market” means the OTC Markets, or, if the OTC Markets is not the principal trading market for the Common Stock, then the principal national securities exchange or securities market on which the Common Stock is traded. “Purchase Agreement” shall have the meaning set forth in the recitals. “Register,” “Registered,” and “Registration” refer to the Registration effected by preparing and filing one (1) or more Registration Statements in compliance with the 1933 Act and pursuant to Rule 415 under the 1933 Act or any successor rule providing for offering securities on a continuous basis (“Rule 415”), and the declaration or ordering of effectiveness of such Registration Statement(s) by the United States Securities and Exchange Commission (the “SEC”). “Registrable Securities” means (i) the shares of Common Stock issued as set forth in the Recitals that were acquired pursuant to the Purchase Agreement, and (ii) any shares of capital stock issued or issuable with respect to such shares of Common Stock, if any, as a result of any stock split, stock dividend, recapitalization, exchange or similar event or otherwise, which have not been (x) included in the Registration Statement that has been declared effective by the SEC, or (y) sold under circumstances meeting all of the applicable conditions of Rule 144 (or any similar provision then in force) under the 1933 Act. “Registration Default” shall have the meaning set forth in Section 3.05. “Registration Statement” means the registration statement of the Company filed under the 1933 Act covering the Registrable Securities, including any amendments or supplements thereto and prospectuses contained therein. “Registered Offering Transaction Documents” shall mean this Agreement and the Lock-up Agreement between the Company and the Investor as of the date hereof. “Rule” shall have the meaning set forth in in Section 8.01. “Staff” shall have the meaning set forth in Section 2.03. “Violations” shall have the meaning set forth in in Section 6.01. Section 1.02 All capitalized terms used in this Agreement and not otherwise defined herein shall have the same meaning ascribed to them as in the Purchase Agreement. Section 2.01 The Company shall, within ninety (90) days following the Investor’s written request, prepare and file with the SEC a Registration Statement or Registration Statements (as is necessary) on Form S-1 (or, if such form is unavailable for such a registration, on such other form as is available for such registration), covering the registration and resale of all of the Registrable Securities. Section 2.02 The Company shall use all commercially reasonable efforts to have the Registration Statement(s) declared effective by the SEC as soon as possible after the Company has filed the registration statement. Section 2.03 Notwithstanding the registration obligations set forth in this Section 2, if the staff of the SEC (the “Staff”) or the SEC informs the Company that all of the unregistered Registrable Securities cannot, as a result of the application of Rule 415, be registered for resale as a secondary offering on a single Registration Statement, the Company agrees to promptly (a) inform each of the holders thereof and file amendments to the Registration Statement as required by the SEC and/or (b) withdraw the Registration Statement and file a new registration statement (the “New Registration Statement”), in either case covering the maximum number of Registrable Securities permitted to be registered by the SEC, on Form S-1 to register for resale the Registrable Securities as a secondary offering. If the Company amends the Registration Statement or files a New Registration Statement, as the case may be, under clauses (a) or (b) above, the Company will file with the SEC, as promptly as allowed by the Staff or SEC, one or more registration statements on Form S-1 to register for resale those Registrable Securities that were not registered for resale on the Registration Statement, as amended, or the New Registration Statement (each, an “Additional Registration Statement”). Section 3.01 The Company shall use all commercially reasonable efforts to cause such Registration Statement relating to the Registrable Securities to become effective and shall keep such Registration Statement effective until the Investor shall have sold all the Registrable Securities (the “Registration Period”). The Registration Statement shall not contain any untrue statement of a material fact or omit to state a material fact required to be stated therein, or necessary to make the statements therein, in light of the circumstances in which they were made, not misleading. The Company shall use all commercially reasonable efforts to respond to all SEC comments within ten (10) business days from receipt of such comments by the Company. The Company shall use all commercially reasonable efforts to cause the Registration Statement relating to the Registrable Securities to become effective no later than three (3) business days after notice from the SEC that the Registration Statement may be declared effective. Section 3.02 The Company shall prepare and file with the SEC such amendments (including post-effective amendments) and supplements to the Registration Statement and the prospectus used in connection with such Registration Statement, which prospectus is to be filed pursuant to Rule 424 promulgated under the 1933 Act, as may be necessary to keep such Registration Statement effective during the Registration Period, and, during such period, comply with the provisions of the 1933 Act with respect to the disposition of all Registrable Securities of the Company covered by such Registration Statement until such time as all of such Registrable Securities shall have been disposed of in accordance with the intended methods of disposition by the Investor thereof as set forth in such Registration Statement. preliminary prospectus) and, with regards to such Registration Statement(s), any correspondence by or on behalf of the Company to the SEC or the staff of the SEC and any correspondence from the SEC or the staff of the SEC to the Company or its representatives; (b) upon the effectiveness of any Registration Statement, the Company shall make available copies of the prospectus, via EDGAR, included in such Registration Statement and all amendments and supplements thereto; and (c) such other documents, including copies of any preliminary or final prospectus, as the Investor may reasonably request from time to time to facilitate the disposition of the Registrable Securities. Section 3.04 The Company shall use all commercially reasonable efforts to (a) register and qualify the Registrable Securities covered by the Registration Statement under such other securities or “blue sky” laws of such states in the United States as the Investor reasonably requests; (b) prepare and file in those jurisdictions, such amendments (including post-effective amendments) and supplements to such registrations and qualifications as may be necessary to maintain the effectiveness thereof during the Registration Period; (c) take such other actions as may be necessary to maintain such registrations and qualifications in effect at all times during the Registration Period, and (d) take all other actions reasonably necessary or advisable to qualify the Registrable Securities for sale in such jurisdictions; provided, however, that the Company shall not be required in connection therewith or as a condition thereto to (i) qualify to do business in any jurisdiction where it would not otherwise be required to qualify but for this Section 3.04, or (ii) subject itself to general taxation in any such jurisdiction. The Company shall promptly notify the Investor who holds Registrable Securities of the receipt by the Company of any notification with respect to the suspension of the registration or qualification of any of the Registrable Securities for sale under the securities or “blue sky” laws of any jurisdiction in the United States or its receipt of actual notice of the initiation or threatening of any proceeding for such purpose. Section 3.06 The Company shall use all commercially reasonable efforts to prevent the issuance of any stop order or other suspension of effectiveness of the Registration Statement, or the suspension of the qualification of any of the Registrable Securities for sale in any jurisdiction and, if such an order or suspension is issued, to obtain the withdrawal of such order or suspension at the earliest possible moment and to notify the Investor holding Registrable Securities being sold of the issuance of such order and the resolution thereof or its receipt of actual notice of the initiation or threat of any proceeding concerning the effectiveness of the registration statement. Section 3.07 The Company shall make available to investor as far in advance as reasonably practicable before filing the Registration Statement or any supplement or amendment thereto, upon request, copies of reasonably complete drafts of all such documents proposed to be filed, and provide Investor the opportunity to reasonably object to any information pertaining to such Investor and its plan of distribution that is contained therein and make the corrections reasonably requested by Investor with respect to such information prior to filing the Registration Statement or supplement or amendment thereto. Section 3.08 The Company shall hold in confidence and not make any disclosure of information concerning the Investor unless (a) disclosure of such information is necessary to comply with federal or state securities laws, (b) the disclosure of such information is necessary to avoid or correct a misstatement or omission in any Registration Statement, or (c) the release of such information is ordered pursuant to a subpoena or other final, non-appealable order from a court or governmental body of competent jurisdiction. The Company agrees that it shall, upon learning that disclosure of such information concerning the Investor is sought in or by a court or governmental body of competent jurisdiction or through other means, give prompt written notice to the Investor and allow the Investor, at the Investor’s expense, to undertake appropriate action to prevent disclosure of, or to obtain a protective order covering such information. Section 3.09 The Company shall use all commercially reasonable efforts to maintain designation and quotation of all the Registrable Securities covered by any Registration Statement on the Principal Market. If, despite the Company’s commercially reasonable efforts, the Company is unsuccessful in satisfying the preceding sentence, it shall use commercially reasonable efforts to cause all the Registrable Securities covered by any Registration Statement to be listed on each other national securities exchange and automated quotation system, if any, on which securities of the same class or series issued by the Company are then listed, if any, if the listing of such Registrable Securities is then permitted under the rules of such exchange or system. The Company shall pay all fees and expenses in connection with satisfying its obligation under this Section 3.09. Section 3.10 The Company shall cooperate with the Investor to facilitate the prompt preparation and delivery the Registrable Securities to be offered pursuant to the Registration Statement and enable such Registrable Securities to be in such denominations or amounts, as the case may be, as the Investor may reasonably request. Section 3.11 The Company shall provide a transfer agent for all the Registrable Securities not later than the effective date of the first Registration Statement filed pursuant hereto. Section 3.12 If requested by the Investor, the Company shall (a) as soon as reasonably practical incorporate in a prospectus supplement or post-effective amendment such information as the Investor reasonably determines should be included therein relating to the sale and distribution of Registrable Securities, including, without limitation, information with respect to the offering of the Registrable Securities to be sold in such offering; (b) make all required filings of such prospectus supplement or post-effective amendment as soon as reasonably possible after being notified of the matters to be incorporated in such prospectus supplement or post-effective amendment; and (c) supplement or make amendments to any Registration Statement if reasonably requested by the Investor. Section 3.13 The Company shall use all commercially reasonable efforts to cause the Registrable Securities covered by the applicable Registration Statement to be registered with or approved by such other governmental agencies or authorities as may be necessary to facilitate the disposition of such Registrable Securities. Section 3.14 The Company shall otherwise use all commercially reasonable efforts to comply with all applicable rules and regulations of the SEC in connection with any registration hereunder. Section 3.15 Within five (5) business day after the Registration Statement which includes Registrable Securities is declared effective by the SEC, the Company shall deliver to the transfer agent for such Registrable Securities, with copies to the Investor, confirmation that such Registration Statement has been declared effective by the SEC. Section 3.16 The Company shall take all other reasonable actions necessary to expedite and facilitate disposition by the Investor of Registrable Securities pursuant to the Registration Statement. Section 4.01 At least ten (10) business days prior to the first anticipated filing date of any Registration Statement, the Company shall notify the Investor in writing of the information the Company reasonably requires from the Investor for the Registration Statement. Investor shall provide such information to the Company at least five (5) business days prior to the first anticipated filing date of such Registration Statement if Investor elects to have any of the Registrable Securities included in such Registration Statement, and the Investor shall execute such documents in connection with such registration as the Company may reasonably request. The Investor covenants and agrees that, in connection with any sale of Registrable Securities by it pursuant to the Registration Statement, it shall comply with the “Plan of Distribution” section of the then current prospectus relating to such Registration Statement. Section 4.02 The Investor, by its acceptance of the Registrable Securities, agrees to cooperate with the Company as reasonably requested by the Company in connection with the preparation and filing of any Registration Statement hereunder, unless the Investor has notified the Company in writing of an election to exclude all of the Investor’s Registrable Securities from such Registration Statement. Section 4.03 The Investor agrees that, upon receipt of written notice from the Company of the happening of any event of the kind described in Section 3.06 or the first sentence of Section 3.05, the Investor will immediately discontinue disposition of Registrable Securities pursuant to any Registration Statement(s) covering such Registrable Securities until the Investor’s receipt of the copies of the supplemented or amended prospectus contemplated by Section 3.06 or the first sentence of Section 3.05. All legal expenses, other than underwriting discounts and commissions and other than as set forth in the Purchase Agreement, incurred in connection with registrations including comments, filings or qualifications pursuant to Sections 2 and 3, including, without limitation, all registration, listing and qualifications fees, and printing fees shall be paid by the Company. Notwithstanding the foregoing, the Investor shall bear its own legal expenses in connection with this Agreement and the review of any Registration Statement or amendment thereto. 1934, as amended (the “1934 Act”) (each, an “Indemnified Person”), against any losses, claims, damages, liabilities, judgments, fines, penalties, charges, costs, attorneys’ fees, amounts paid in settlement or expenses, joint or several (collectively, “Claims”), incurred in investigating, preparing or defending any action, claim, suit, inquiry, proceeding, investigation or appeal taken from the foregoing by or before any court or governmental, administrative or other regulatory agency, body or the SEC, whether pending or threatened, whether or not an indemnified party is or may be a party thereto (“Indemnified Damages”), to which any of them may become subject insofar as such Claims (or actions or proceedings, whether commenced or threatened, in respect thereof) arise out of or are based upon: (i) any untrue statement or alleged untrue statement of a material fact in the Registration Statement or any post-effective amendment thereto or in any filing made in connection with the qualification of the offering under the securities or other “blue sky” laws of any jurisdiction in which the Investor has requested in writing that the Company register or qualify the Shares, or the omission or alleged omission to state a material fact required to be stated therein or necessary to make the statements therein, in light of the circumstances under which the statements therein were made, not misleading, (ii) any untrue statement or alleged untrue statement of a material fact contained in the final prospectus (as amended or supplemented, if the Company files any amendment thereof or supplement thereto with the SEC) or the omission or alleged omission to state therein any material fact necessary to make the statements made therein, in light of the circumstances under which the statements therein were made, not misleading, or (iii) any violation or alleged violation by the Company of the 1933 Act, the 1934 Act, any other law, including, without limitation, any state securities law, or any rule or regulation thereunder relating to the offer or sale of the Registrable Securities pursuant to the Registration Statement (the matters in the foregoing clauses (i) through (iii) being, collectively, “Violations”). Subject to the restrictions set forth in Section 6.03, the Company shall reimburse the Investor and each such controlling person, promptly as such expenses are incurred and are due and payable, for any reasonable legal fees or other reasonable expenses incurred by them in connection with investigating or defending any such Claim. Notwithstanding anything to the contrary contained herein, the indemnification agreement contained in this Section 6.01 shall not apply to a Claim arising out of or based upon a Violation (i) which is due to the inclusion in the Registration Statement of the information furnished in writing to the Company by any Indemnified Person expressly for use in connection with the preparation of the Registration Statement or any such amendment thereof or supplement thereto; or (ii) to the extent such Claim is based on (1) a failure of the Investor to deliver or to cause to be delivered the prospectus made available by the Company, (2) the Indemnified Person’s use of an incorrect prospectus despite being promptly advised in advance by the Company in writing not to use such incorrect prospectus, or (3) the manner of sale of the Registrable Securities by the Investor or of the Investor’s failure to register as a dealer under applicable securities laws. Such indemnity shall remain in full force and effect regardless of any investigation made by or on behalf of the Indemnified Person and shall survive the resale of the Registrable Securities by the Investor pursuant to the Registration Statement. Party and shall survive the resale of the Registrable Securities by the Investor pursuant to the Registration Statement. Notwithstanding anything to the contrary contained herein, the indemnification agreement contained in this Section 6.02 with respect to any preliminary prospectus shall not inure to the benefit of any Indemnified Party if the untrue statement or omission of material fact contained in the preliminary prospectus was corrected on a timely basis in the prospectus, as then amended or supplemented. Section 6.03 Promptly after receipt by an Indemnified Person or Indemnified Party under this Section 6 of notice of the commencement of any action or proceeding (including any governmental action or proceeding) involving a Claim, such Indemnified Person or Indemnified Party shall, if a Claim in respect thereof is to be made against any indemnifying party under this Section 6, deliver to the indemnifying party a written notice of the commencement thereof, and the indemnifying party shall have the right to participate in, and, to the extent the indemnifying party so desires, jointly with any other indemnifying party similarly noticed, to assume control of the defense thereof with counsel mutually satisfactory to the indemnifying party and the Indemnified Person or the Indemnified Party, as the case may be; provided, however, that an Indemnified Person or Indemnified Party shall have the right to retain its own counsel with the fees and expenses to be paid by the indemnifying party, if, in the reasonable opinion of counsel retained by the Indemnified Person or Indemnified Party, the representation by counsel of the Indemnified Person or Indemnified Party and the indemnifying party would be inappropriate due to actual or potential differing interests between such Indemnified Person or Indemnified Party and any other party represented by such counsel in such proceeding. The indemnifying party shall pay for only one (1) separate legal counsel for the Indemnified Persons or the Indemnified Parties, as applicable, and such counsel shall be selected by the Investor, if the Investor is entitled to indemnification hereunder, or the Company, if the Company is entitled to indemnification hereunder, as applicable. The Indemnified Party or Indemnified Person shall cooperate fully with the indemnifying party in connection with any negotiation or defense of any such action or Claim by the indemnifying party and shall furnish to the indemnifying party all information reasonably available to the Indemnified Party or Indemnified Person which relates to such action or Claim. The indemnifying party shall keep the Indemnified Party or Indemnified Person fully apprised at all times as to the status of the defense or any settlement negotiations with respect thereto. No indemnifying party shall be liable for any settlement of any action, claim or proceeding affected without its written consent, provided, however, that the indemnifying party shall not unreasonably withhold, delay or condition its consent. No indemnifying party shall, without the consent of the Indemnified Party or Indemnified Person, consent to entry of any judgment or enter into any settlement or other compromise which does not include as an unconditional term thereof the giving by the claimant or plaintiff to such Indemnified Party or Indemnified Person of a release from all liability in respect to such Claim. Following indemnification as provided for hereunder, the indemnifying party shall be subrogated to all rights of the Indemnified Party or Indemnified Person with respect to all third parties, firms or corporations relating to the matter for which indemnification has been made. The failure to deliver written notice to the indemnifying party within a reasonable time of the commencement of any such action shall not relieve such indemnifying party of any liability to the Indemnified Person or Indemnified Party under this Section 6, except to the extent that the indemnifying party is prejudiced in its ability to defend such action. Section 6.04 The indemnity agreements contained herein shall be in addition to (a) any cause of action or similar right of the Indemnified Party or Indemnified Person against the indemnifying party or others, and (b) any liabilities the indemnifying party may be subject to pursuant to the law. indemnification under the fault standards set forth in Section 6; (ii) no seller of Registrable Securities guilty of fraudulent misrepresentation (within the meaning of Section 11(f) of the 1933 Act) shall be entitled to contribution from any seller of Registrable Securities who was not guilty of fraudulent misrepresentation; and (iii) contribution by any seller of Registrable Securities shall be limited in amount to the net amount of proceeds received by such seller from the sale of such Registrable Securities. (e)cooperate with the Investor to facilitate the timely preparation and delivery of certificates representing the Registrable Securities to be sold pursuant to such Registration Statement or Rule 144 free of any restrictive legends and representing such number of shares of Common Stock and registered in such names as the holders of the Registrable Securities may reasonably request a reasonable period of time prior to sales of Registrable Securities pursuant to such Registration Statement or Rule 144; provided, that the Company may satisfy its obligations hereunder without issuing physical stock certificates through the use of The Depository Trust Company's Direct Registration System. Section 9.02 NO WAIVERS. Failure of any party to exercise any right or remedy under this Agreement or otherwise or delay by a party in exercising such right or remedy, shall not operate as a waiver thereof. Section 9.03 NO ASSIGNMENTS. The rights to cause the Company to register Registrable Securities granted to the Investor by the Company hereunder may be transferred or assigned by Investor to one or more transferees or assignees of Registrable Securities; provided, however, that the Company is given written notice prior to any said transfer or assignment, stating the name and address of each such transferee or assignee and identifying the securities with respect to which such registration rights are being transferred or assigned, and each such transferee or assignee assumes in writing responsibility for its portion of the obligations of Investor under this Agreement. Section 9.04 ENTIRE AGREEMENT/AMENDMENT. This Agreement and the Registered Offering Transaction Documents constitute the entire agreement among the parties hereto with respect to the subject matter hereof and thereof. There are no restrictions, promises, warranties or undertakings, other than those set forth or referred to herein and therein. This Agreement and the Registered Offering Transaction Documents supersede all prior agreements and understandings among the parties hereto with respect to the subject matter hereof and thereof. The provisions of this Agreement may be amended only with the written consent of the Company and Investor. Section 9.05 HEADINGS. The headings in this Agreement are for convenience of reference only and shall not limit or otherwise affect the meaning hereof. Whenever required by the context of this Agreement, the singular shall include the plural and masculine shall include the feminine. This Agreement shall not be construed as if it had been prepared by one of the parties, but rather as if all the parties had prepared the same. Section 9.06 COUNTERPARTS. This Agreement may be executed in any number of counterparts and by the different signatories hereto on separate counterparts, each of which, when so executed, shall be deemed an original, but all such counterparts shall constitute but one and the same instrument. This Agreement may be executed by facsimile transmission, PDF, electronic signature or other similar electronic means with the same force and effect as if such signature page were an original thereof. Section 9.07 FURTHER ASSURANCES. Each party shall do and perform, or cause to be done and performed, all such further acts and things, and shall execute and deliver all such other agreements, certificates, instruments and documents, as the other party may reasonably request in order to carry out the intent and accomplish the purposes of this Agreement and the consummation of the transactions contemplated hereby. Section 9.08 SEVERABILITY. In case any provision of this Agreement is held by a court of competent jurisdiction to be excessive in scope or otherwise invalid or unenforceable, such provision shall be adjusted rather than voided, if possible, so that it is enforceable to the maximum extent possible, and the validity and enforceability of the remaining provisions of this Agreement will not in any way be affected or impaired thereby. Section 9.09 SPECIFIC PERFORMANCE. Damages in the event of breach of this Agreement by a party hereto may be difficult, if not impossible, to ascertain, and it is therefore agreed that each such Person, in addition to and without limiting any other remedy or right it may have, will have the right to an injunction or other equitable relief in any court of competent jurisdiction, enjoining any such breach, and enforcing specifically the terms and provisions hereof, and each of the parties hereto hereby waives any and all defenses it may have on the ground of lack of jurisdiction or competence of the court to grant such an injunction or other equitable relief. The existence of this right will not preclude any such Person from pursuing any other rights and remedies at law or in equity that such Person may have. shall constitute good and sufficient service of process and notice thereof. Nothing contained herein shall be deemed to limit in any way any right to serve process in any other manner permitted by law. Section 9.11 NO THIRD-PARTY BENEFICIARIES. This Agreement is intended for the benefit of the parties hereto and is not for the benefit of, nor may any provision hereof be enforced by, any other person, except that the Company acknowledges that the rights of the Investor may be enforced by its general partner.